Don’t you have a stunt guy? In May, we had a Madison based client approach us about creating a fun video for a product being launched in June. The question: “Can you guys pull this off in 6 weeks?” Our answer “OF COURSE!” Oh. Crap. What exactly do you mean by ninjas Mr. Director? “Well, you know, flips and acrobatic moves, weapons, martial arts, and fighting.” “Don’t you have a stunt guy?” No I don’t. Now dear readers, I hope you believe in miracles because what follows can only be described as one. I have made amazing things possible as a producer: pyrotechnics, steamrollers, boats, filming on the National Mall. But I have never pulled off a shoot like this with the time constraints. I am an anxious person, and I became very anxious about this shoot. This seemed impossible. So I created a mantra to stave off impending doom: “This job is simply a set of problems that need to be solved. Julia, you are an excellent problem solver! Day one: in studio interrogation; day two: car and outside stuff; day three: ninja stuff outside around the warehouse. When do we need all the elements? Day one we’ll need the studio, our interrogators, and our lead. Day two we’ll need the warehouse exterior, interrogators, our lead, our stunt guy and the car. 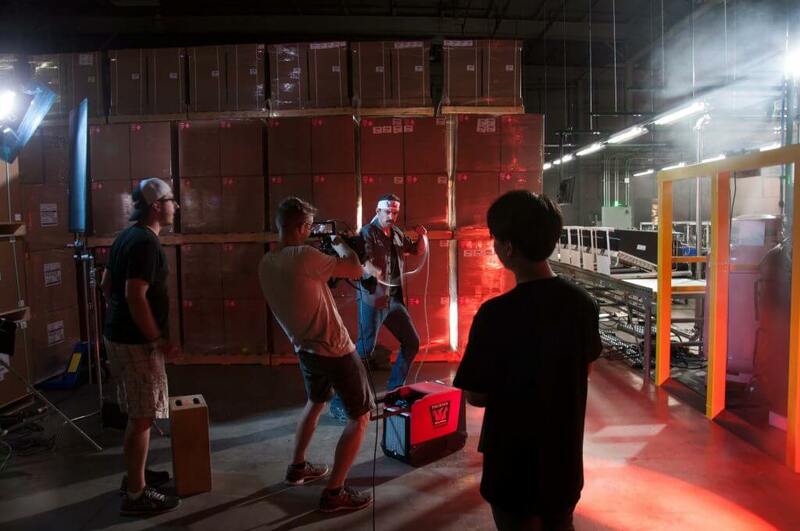 Day three we’ll need the warehouse exterior, our lead, our ninjas, and extras. Check, check, check. Looking at the month of May, there were literally only 3 days that would work. I hope the actor is available or all bets are off. He’s available!! Hooray! Our DP is only available 2 of the 3 days. What are we going to do??? Sometimes problems are solved simply by waiting. Guess who became available all 3 days? Our amazing DP, looks like things are starting to come together. So what’s the weather? Rain forecast every day. Ok, two days of three outside is not going to work. Move the whole ninja scene inside the warehouse. 2 of the 3 days will be filmed inside. Problem solved. Second, let’s find a car and stunt driver. I have a friend whose husband races cars. Done. Now a car, ideally with a clean title that we can drive but also fill with water and throw mud on it and as cheap as possible. My driver found a Mazda 626 five speed with a clean title!!! He will pick it up for us, clean it up, make sure it drives safely over the weekend and is able to drive it to our location. Problem solved. I always want to make my directors’ ideas a reality. However, with a time crunch like this I had to say no. “I want a tow truck to pull the vehicle out of a pond. Can you find a pond and rent a tow truck for a day?” “No, I cannot. No tow truck, we don’t have the budget for that.” What about the pond? It’s a Christmas miracle, the client’s warehouse has a drainage ditch/pond behind the building. Any more questions? No. Let’s move on then. What’s next dear readers? Oh yeah stunt people. Cue panic attack. Mantra: This is a problem that needs to be solved. You are an excellent problem solver. Third, where do I find stunt people? Production Hub has a directory of crew and talent. Found a stunt coordinator–called the number. It’s not in service. Not a good start. He has an email address, sent email. Jackpot!! He calls me. I tell him he needs to update his phone number on production hub. He apologizes. And it’s the start of a beautiful collaboration. He is a SAG actor with professional stunt training. He’s worked on several films including The Dark Knight and Fort McCoy. He finds a parkour guy and a martial arts guy who are available for the shoot. He is the real deal. “I am thinking that we won’t use mats. The guys are well trained in falls and jumps and it should look realistic. I will have them wear knee pads and chest armor. Where is the space? Can you send me pictures? I would prefer to be the stunt coordinator only and not have to act so I can focus on choreography and safety.” Yes. You are the one. While all of this is going on, I am still hiring crew, actors, buying craft services, creating a filming schedule, meeting with the client and breathing. Did I mention I was at a two day conference on learning styles? Turns out there is not a learning style called Panic Attack/Cue Mantra. And working pre-production on two other projects requiring my full and undivided attention. The three day shoot went off without a hitch and was so much fun!! I learned some things about myself. Turns out, though not ideal, I can pull off a three day shoot in 8 days. I don’t want every shoot to have a short pre-production like this one, but when called upon, I can do it. This entry was posted in Behind the Scenes, Video and tagged ninjas, producing, stunts. Bookmark the permalink.